Is Monsoon Nectar appropriate for my skin type? Formulated for all skin types, ethnicities, and skin conditions. Based on the principle that the skin either needs to be soothed or stimulated depending on your activities, age/hormones, the season/ weather/environment, illness/injury/ailment, and stress. Customize your skin care regimen according to what your skin needs. 100% organic and natural, these potent formulas are either soothing or stimulating to your skin. Can I use oils if I have acne? Essential oils are anti-bacterial, anti-fungal, and anti-sceptic ~ perfect for treating acne. Soothing to the side effects of Accutane, Acnotin, Roaccutane and other drugs that are extremely drying to the lips and skin. Always check with your doctor first if you are taking medications. All of the products are vegan, except the Green Tea Lip & Eye Balm and Body Balm contains beeswax. 1 year when kept out of direct light and in a cool place. The hydrosol toners last 6 months up to 1 year in a cool, dark place. Refrigeration will prolong the hydrosol shelf life. 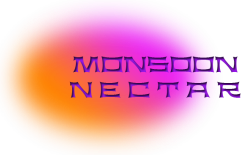 Monsoon Nectar is part of daily bathing and hygiene, you should use your product up within 4-6 months. Keep products away from direct sunlight and in a cool dry place. Why does the color of the product change slightly from time to time? Essential oils and botanicals come from all over the world and the NECTARS are hand made by our manufacturer in the Southwest United States. Small batch formulas ensure freshness. Raw ingredients can vary slightly from crop to crop which can vary the color and texture of each batch. We use minimal, low impact packaging in recyclable containers and our shipping materials are recycled as well. The mixing brush for the Green Tea Mask is shedding! This information is for educational purposes only, it is not intended to treat, cure, prevent or, diagnose any disease or condition. Nor is it intended to prescribe in any way. As with all essential oils, never use undiluted. Do not take internally unless working with a qualified and expert practitioner. Keep away from children. Always perform a small patch test to an insensitive part of the body to check for sensitivities.